Le vivarais takes its name from the diamond shapes you see on the crust. 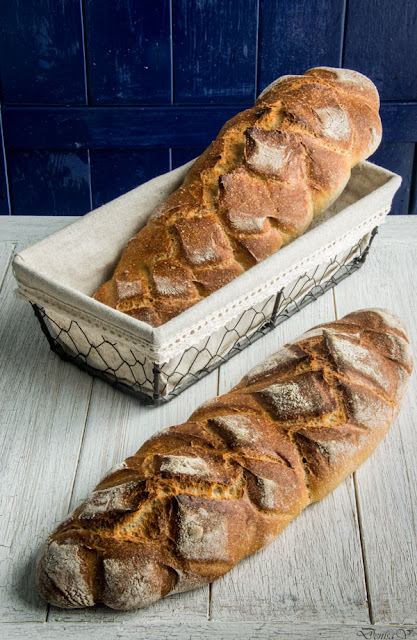 This pattern is not made by scoring the bread with a blade before baking it but by almost cutting the bread before the final fermentation with a dough scraper. When you do this, the dough is flattening a bit, so sustaining the loafs from the sides is a good idea. I put the loaves on a linen towel and wave it between them.Then, I have shrink the loaves so that they support themselves. Nevertheless, you'll get the breads more flatten than with a normal scoring. But in the end, what is really more important: the aspect or the taste? As a home baker, for me, the aspect is nice but the taste is definitely more important. For this bread in particular, the taste beats the aspect! Mix the 2 flours with water for 4 minutes in a standing mixer and let the dough rest covered for the autolyse for 1h. Shape 3 oblong loaves and use a dough cutter to make this pattern. The dough cutter must enter in the dough enough but should not cut until it reach the bottom. This will make the dough to spread a bit on the sides but will create a nice pattern. With this technique scoring is not needed. Final fermentation, covered with towel for 2h at 24ºC. This recipe was inspired from Le Larousse du pain - Eric Kayser, page 256.